Boys hold shrapnel from exploded artillery shells while standing on a street damaged by blasts in Sana’a, the capital of Yemen. The conflict in Yemen has brought “appalling damage” on an already suffering people, the top United Nations humanitarian official told the Security Council today, pressing the international community to redouble its efforts to secure a pause in the fighting respected by all parties, thus providing space for relief workers to reach desperate civilians and for the warring sides to agree a durable ceasefire and, ultimately, a political solution. Humanitarian partners, with the expectation that the planned pause would take hold, had developed an operational plan to reach an additional 3 million people in the initial 5-day period with vital assistance, including three million people with water and sanitation, 600,000 people with life-saving healthcare, 3.1 million people with food and 2,200 children under five years old with treatment for acute malnutrition. In Aden, he stressed, humanitarian partners have reopened health facilities that serve 360,000 people and began a vaccination campaign for 120,000 children. “Brilliant as this is, it is a mere fraction of what is needed, and what could and can be delivered, if the violence and fighting paused, preferably ceased”, underlined the Emergency Relief Coordinator. Finally, Mr. O’Brien reminded Council members that the humanitarian response is “woefully under-resourced”. 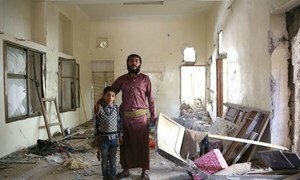 The appeal for Yemen stands at $1.6 billion, of which only 15 per cent – $241 million – has so far been received, he explained. Much has already been spent by UN agencies and their partners advancing their own funds in expectations of the original Saudi pledge of $274 million being forthcoming. “Additional resources are urgently needed – now,” he concluded. Witnessing first-hand the “shocking” devastation in Yemen’s main port city of Aden, the top United Nations relief official in the country today declared that the humanitarian consequences of the conflict are “catastrophic,” making an urgent plea for safe, unhindered access for aid workers and a major scale-up of funding.